Clustering of toxicodynamic parameters according to chemical class. We found that toxicodynamic parameters cluster according to chemical class. Clustering of toxicodynamic parameters according to chemical MOA is more pronounced for GUTS-IT (panels C, D) than for GUTS-SD (panels A, B). 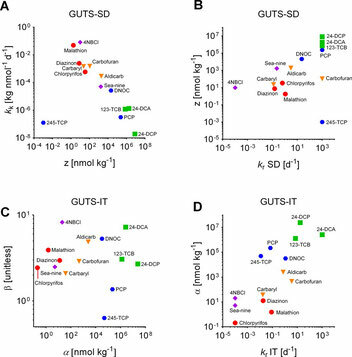 (A) Parameters z and kr in GUTS-SD, (B) Parameters kr and z in GUTS-SD, (C) Parameters α and β in GUTS-IT, (D) Parameters kr and α in GUTS-IT. Green squares: baseline toxicity, blue hexagons: uncoupling of oxidative phosphorylation, orange triangles: AChE inhibition (carbamate), red circles: AChE inhibition (organophosphates), purple diamonds: reactive toxicity.